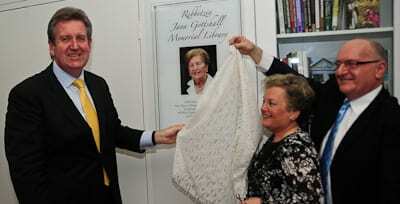 NSW Premier Barry O’Farrell has opened the Rebbetzin Jana Gottshall Memorial Library in the National Council of Jewish Women of Australia’s premises in Sydney. Introduced by the NCJWA [NSW] president Viki Nadel, the Premier spoke of the work of the Council and its long history with Rebbetzin Gottshall. He said: “It gives me very much pleasure to join you today to remember someone who was a true Eshet Chayil–a true woman of worth—Rebbetzin Gottshall, of whom we all hold deep and everlasting memories. And I’m also pleased to be back here at Council House. I’ve attended so many events— including your 85th anniversary dinner—that I feel like I am at home with friends here. I’ve always admired the wonderful work of NCJW. Yours is an organisation which I can easily single out for high accolades among our State’s numerous voluntary community groups. The foresight and vision of Dr Fanny Reading in establishing such a worthy organisation is reflected in the outstanding diversity in your activities. Activities that benefit all Australians, supporting Jewish and non-Jewish causes, while advancing the status of women. There’s also your renowned Best Bargains shop in Bondi, which my Eshet Chayil, Rosemary, wishes you’d expand to the north shore so she can shop there too! Viki, I know you’ve recently taken on presidential responsibilities, passed on by your predecessors, including here today Dalia Sinclair, Dinah Danon and Robyn Lenn. Sound leadership is vital to any organisation. But to NCJW it has always been the foundation, with the result that you will soon celebrate your 90th anniversary of voluntary service to the community. The traditional Jewish blessing is bis hundert & tzwantzig—till 120 years. 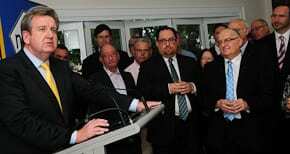 But I wish NCJW to strive far beyond that because Australia will always need vibrant and dynamic organisations like yours. Now today you are honouring and remembering the memory of someone we all had the highest respect, admiration and love for, Rebbetzin Jana Gottshall.  She was also an advocate for the rightful role of women. We know how Rebbetzin Gottshalland her beloved Rabbi Gottshall arrived in Australia as migrants after suffering the traumas of the Holocaust, with a young daughter, Eva, and another baby (my friend Alex) on the way. Their heroism in the concentration camps has been documented and recognised in a permanent exhibition at the Sydney Jewish Museum. In a speech to NCJW a few years after arriving here, Rebbetzin Gottshall summed up what it was like to come by boat to Sydney with nothing but themselves, having lost all their immediate family at the evil hands of the Nazis. “When we arrived, as other migrants did, we were drowning, struggling and helpless, not knowing what was ahead but we had no choice but to leave our traumatic past behind. Migration is a very trying, dreadful situation if you don’t speak the language, have no money, employment or accommodation”. How fortunate or b’shert that NCJW founder, Dr Fanny Reading, was there to help, to provide the understanding and give ongoing hope to the Gottshall family—and many thousands of others—through the volunteers of the National Council of Jewish Women. I am sure you’ve all heard Rebbetzin Gottshall’s hilarious story about her invitation to a Newcastle Red Cross event and her misunderstanding what “preparing the toast” involved. But you may not know that, soon after Dr Fanny Reading had delivering her baby boy, the nurse asked Rebbetzin Gottshall if she was ready to feed her “kid”. With limited knowledge of English, she thought the term “kid” meant a goat, so understandably she was shaken and tearful at this seeming insult. Of course she soon learned that the word “kid” is an endearing term often used for children in Australia. Dr Fanny Reading’s friendship included naming Jana Gottshall as Council’s honorary rebbetzin and she also left instructions in her will that Rabbi Gottshall should officiate at her funeral. Just like you, I can vividly recall how Rebbetzin Gottshall exuded goodness and charm. She always took an interest in those around her, showing compassion with a warm smile and hand of friendship. I know how Jewish tradition highlights the importance of charity and kindness. The Talmud teaches that compassion and acts of goodness are the trademarks of the Jewish soul. Assisting someone in need can be by giving gifts or money, but Rebbetzin Gottshall showed this in another significant way. She gave something equally important—her time—in guiding, advising, motivating, or just being a listening ear. We remember her reassuring way of saying something to make you feel valued and respected, an uplifting word to someone who was feeling down or a warm “hello” to a friend or a stranger. The Talmud also teaches that the person who gives a coin to the poor receives three types of blessings, but the person who says a soothing word and makes someone feel better, then deserves to be given eleven blessings. So that sums up the woman we knew who’s being remembered by this permanent and living collection of reference books. Jana Gottshall never differentiated between whether religious or not. Her kindness, compassion and tolerance was always there for everyone with whom she came into contact. It’s appropriate then that NCJW is honouring our beloved Rebbetzin Gottshall with this library of specialist books on Jewish women’s issues. 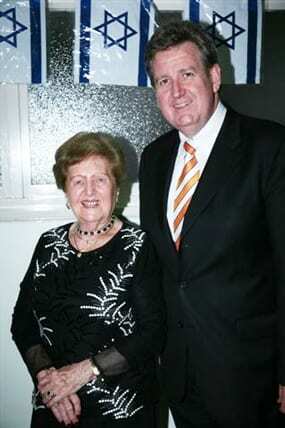 The opening was attended by Rebbetzin Gottshall’s children Alex Gottshall and Eva Wittenberg. He certainly looks as if he’s at home among friends no question about that, just look at the body language with Rebbetzin Gottshall. One for the family album.